Mycophenolic acid is a potent IMPDH inhibitor and the active metabolite of an immunosuppressive drug, used to prevent rejection in organ transplantation. MK-8245 is an liver-targeting inhibitor of stearoyl-CoA desaturase (SCD) with IC50 of 1 nM for human SCD1 and 3 nM for both rat SCD1 and mouse SCD1, with anti-diabetic and anti-dyslipidemic efficacy. Phase 2. PluriSIn #1 is an inhibitor of the stearoyl-coA desaturase 1 (SCD1), which is able to selectively eliminate hPSCs. Ammonium Glycyrrhizinate inhibits growth and cytopathology of several unrelated DNA and RNA viruses. Gimeracil is an inhibitor of dihydropyrimidine dehydrogenase, which inhibits the early step in homologous recombination for double strand breaks repair. ML390 is a human DHODH inhibitor that induces differentiation in acute myeloid leukemia. Isovaleramide is an anticonvulsant molecule isolated from Valeriana pavonii, it inhibits the liver alcohol dehydrogenases. SW033291 is a selective inhibitor of 15-hydroxyprostaglandin dehydrogenase (15-PGDH) with IC50 and Kiapp of 1.5 nM and 0.1 nM, respectively. NCT-501 is a potent and selective inhibitor of Aldehyde Dehydrogenase 1A1 (ALDH1A1) with IC50 of 40 nM. RRx-001 is a novel epigenetic modulator with potential radiosensitizing activity. It inhibits glucose 6-phosphate dehydrogenase(G6PD) in human tumor cells, binds hemoglobin and drives RBC-mediated redox reactions under hypoxia. Daidzin, a natural organic compound in the class of phytochemicals known as isoflavones, is a potent and selective inhibitor of human mitochondrial aldehyde dehydrogenase and inhibits ALDH-I selectively (Ki=20 nM); at least 500 times less effective against ALDH-Ⅱ, the cytosolic isozyme (Ki=10 μM). Emodin is a purgative resin, 6-methyl-1,3,8-trihydroxyanthraquinone, from rhubarb, the buckthorn and Japanese Knotweed (Fallopia japonica). Enoxolone is a pentacyclic triterpenoid derivative of the beta-amyrin type obtained from the hydrolysis of glycyrrhizic acid, which was obtained from the herb liquorice. 3-Nitropropionic acid (3-NP) is an irreversible inhibitor of mitochondrial respiratory Complex II succinate dehydrogenase, resulting in energy depletion through disruption of the electron transport chain. 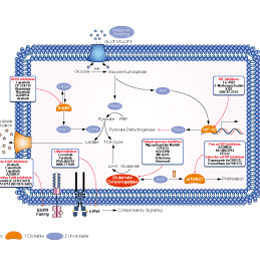 Dichloroacetate, a specific inhibitor of pyruvate dehydrogenase kinase (PDK) with IC50 values of 183 and 80 μM for PDK2 and PDK4 respectively, has been shown to derepress a mitochondrial potassium-ion channel axis, trigger apoptosis in cancer cells, and inhibit tumor growth. Vorasidenib (AG-881) is an orally available inhibitor of mutated forms of both isocitrate dehydrogenase 1 and 2 (IDH1 and IDH2). Enasidenib (AG-221) is a first-in-class, oral, potent, reversible, selective inhibitor of the IDH2 mutant enzyme with IC50 of 12 nM. Alda 1 is an ALDH2 agonist that activates catalysis for both wild-type ALDH2 (ALDH2*1) and ALDH2*2.